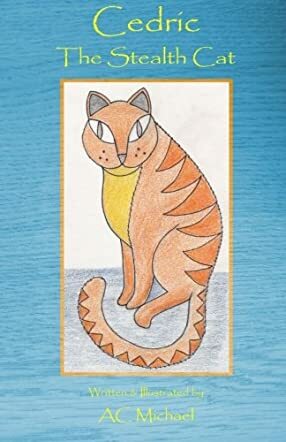 Cedric, The Stealth Cat by AC Michael is a funny rhyming story about Cedric the cat who gets lost at sea. When he reaches land, he meets a mouse who tries to help him and feed him. Cedric soon turns to a life of crime because he only wants to eat fish. The mouse does not like Cedric stealing tins of fish so he decides to teach him a lesson. I chose to read Cedric, The Stealth Cat with my 5-year-old daughter because it looked like it would be a good story. Michael did not disappoint us. The story was very entertaining. This is not a short story so I was impressed by how well it rhymed the whole way through. My daughter loved that Michael used so many colors in the sentences in the book. She also enjoyed the illustrations. They were small, hand drawn, and displayed the different scenes. My daughter enjoyed seeing the stinky, fat cat. I liked seeing the different fish that Seamus would catch. I love stories that have a lesson in them. This story itself teaches kids that stealing is wrong. This is a book that I plan to keep in my collection. Cedric, The Stealth Cat is the fourth book in the Curious Characters Series and the first one I have read. I really enjoyed it and plan to read the other books in this series. I know that they will all be as good as this one.